Google Talk/Chat/Messenger is normally used by humans to interact with other humans. However, its underlying technology can also be used as a mechanism to implement software robots. Internet bots, also known as web robots, WWW robots or simply ‘bots’ can also utilize the technology to perform automated functions over the web. There are many such bots in existence, offering a diverse spectrum of services from jokes (jokes@askme.im) to URL Shortening using bit.ly (url@askme.im), even mathematical calculation (math@bot.im). Using such bots is quick and easy to configure, all that must be done is to add the bot as a contact to your messaging account. Then, whenever you desire data from the service, simply text the command to the bot and it will respond with the respective message. The Raspi Bot is essentially the same as any other automated Internet robot. To configure it, it must first have its own e-mail address associated with a Google talk account. This e-mail address must also be added as a contact with the account that wishes to communicate to the bot. Then, whenever the script is running on the remote machine, it will log into Google chat and appear as a friend in your contact list. The software itself is essentially just a Python daemon script that is a wrapper around the XMPP protocol. When executed, the script will sign in to Google talk using its own username and password. The Python script is derived from the open source project pygtalkrobot: An open source python gtalk(google talk) bot framework using XMPPPY and PyDNS libraries, that also references the source code of python-jabberbot. For example, sending the message “pinon 10” will turn on GPIO pin #10, “read 8” will read the current state of GPIO pin 8, or “bash ps” to execute the shell command ‘ps’. One of the most obvious usages of this technology is for home automation purposes. The Raspi Bot can be accessed anywhere with Google talk, which to my understanding, is nearly every system in existence. 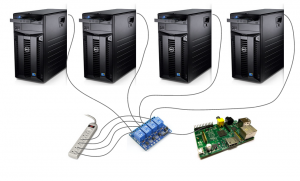 Send the Raspi Bot messages to turn on and off lights and other electrical appliances. This is also useful to provide immediate notification in the event of intrusion detection. The Raspi Bot can be supplemented with additional security sensors, including infrared motion, and ultrasonic distance sensors. If any pre-programmed sensor violates any predefined condition, you can be immediately notified via message from the Raspi Bot. The Raspi Bot can be used essentially as a remote shell. In this configuration, every message sent to the Raspi Bot will be interpreted as a shell command with the output piped back to the user in the form of a response message. Obviously, this could raise some security concerns. To protect against misuse, the Raspi Bot will only respond to Google chat messages from the Google user designated as the administrator of the bot. By default, messages from any other user will simply be ignored. Arguably, disclosure of any amount of information about system can be considered a security issue such as that reported by some of the above tools. For users more concerned about convenience over security exposure, much more elaborate commands can be run, such as executing additional scripts or accessing private data. Thanks… Glad to hear you found it useful! Thanks a lot, this is great. When I do it like on that page it works fine, I can’t figure out what’s different here. Any ideas? It looks like your problem might be the pin mode of the GPIO. 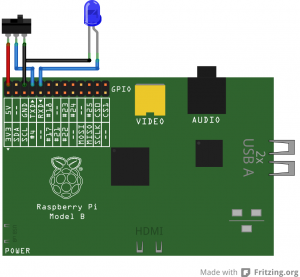 There are two GPIO numbering modes for the Raspberry Pi: board and BCM. My bot script uses GPIO.setmode(GPIO.BOARD) and the example in your link uses GPIO.setmode(GPIO.BCM). So pin 8 is likely actually turning on and off, just not necessarily the pin 8 that you think. Yup that was it, thanks a lot, working perfectly now. Hello Alex, Thanks for putting this together. It is very awesome!!! So, Your user case #1 is very interesting, however, how do you trigger the gtalkrobot to send a new message? Say if you push a button and wanting gtalkrobot to send a message to a user. i can’t quiet figure out how to do that, and I hope you can help. I was wondering the same thing – I found this site http://xmpppy.sourceforge.net/basic.html that describes how to do exactly this (minus the GPIO part). Cool… I will check it out. Thanks for the find and reply!!! I will let you know how it goes. Hello Min-Hsao. were you successful with the “case #1” ? I want to do the same thing – but I don´t know how…. I want to get a message from the raspi, if one GPIO goes from 0 to 1 (low to high level). thanks a lot for your wonderful work. having a minor problem. my gtalkbot goes offline after 2/3 minutes, everythingworks perfect within that time. so i decided to assign a crontab task to run the script every 2 minutes. hope you can help. thanks again. Small problem here. I got the Bot working on Raspberry Pi. I can send commands to it but it won’t reply to my Talk. I get error “Warning: unable to estabilish secure connection – TLS failed!” on startup, the bot flashes green on my on talk and turns offline right away. Now got it working, or atleast it stopped whine about TLS, by changing port number to 5222(if I remember correctly). Can this system send messages by itself? I have 1-wire reading temps around and say I like GtalkBot to send message if outside temp drops below zero. Hi, I got the same error, could you tell me what is the port and how should I change it? Thank you very much! It wasn’t replying to my commands also, but when i reverted back to Gtalk(from Hangout) i started receiving replies. Have you managed to solve the timeout issue at all? I have something very similar for interacting with my home server, based on PyGtalkRobot. However, after a period of inactivity the client program disconnects. I cant figure out where the disconnection is happening. i put conres=self.conn.connect( server=(self.server_host, self.server_port),secure=0 ) in pygtalkrobot.py file then its failing to connect. unable to authorize gmail.com please check your username/password. Mine is now failing to connect whether or not I put ,secure=0 in there. Did Google change the protocol and break something? Thanks for the tutorial. I managed to get it to work but it will only output the results to the terminal session and not back to my chat session. If i run “shell ls” it outputs correctly on pi session but does not return anything in the chat window. Any one having this issue? Hi Michael!, thanks for this post!… I followed your instructions and got it working on my raspberry pi, but the problem is that the program gets disconnected with Google Talk in 2 mins… I changed the port 5222 but still the issue is not getting resolved!… please help! I had this same issue, I fixed it by creating a separate thread to send an empty packet every 300 seconds (5 mins). This kept my bot alive and well. Hi Matt!, can you please tell me on how to do it?.. Hi Matt, can you post/email whole file with keepalive? 🙂 Also, ihave you managed to run Bot at rebbot, there’s no help with rc.local or crontab. Thank! this is awesome, but for a remote control system, it’s essential to be able to run raspiBot.py on boot-up. Do you have any suggestions how this is done ? I ask because so far all the help i’ve had does not work. Appreciate any help you can give. I found that by starting it with init.d, it started too soon and couldn’t contact the server, and would just fail. I start and stop mine from a script in /etc/network/if-up.d and /if-down.d. All scripts in these folders are run in alphabetical order after the interface is brought up and before it is brought down, respectively, which is the perfect time to start and stop a network-based daemon. Please is there any *.py example how to send message when GPIO IN trigered????? temperature is below/higher from DS18B20 ? MANY THANKS for example of code or part of code to paste!!! I created a separate script that does that for my home automation project. You can strip out the original bot script yourself too. Leave only the login and replyMessage sections, plus anything else that you think you’ll need. login once, wait for your gpio pin to change state, and then to send a message, you just reply. I’m guessing you’ll be putting the wait and the reply in a loop so that it sends one message when it goes high and another when it goes low, but you could just as easily exit the program after it changes once. Hey, can you explain that please ? I have a problem, I can send commands to Raspberry but it won’t reply to my GTalk. Why? I had same problem and was not able to find a solution. Same problem here, some infos? Thanks a lot for this, very very cool! How to run a bash script without specifying its location? What I hope to have are simple phrases like ‘hello’ that people can talk (to trigger some action). Turns out just gotta add script to /usr/bin (vs. another directory). That, or you can add the directory that contains your scripts to the path. Or specify the path when you call the script (i.e. if I receive “hello” then run “~/raspi_gtalk_robot/scripts/hello.py”) Linux almost always has lots of ways to do what you want. The bot will respond to anyone who sends messages to it. You may want to restrict the bash command or disable it by default. ‘bash top’ (and likely any command requiring input) makes the bot non-responsive. If you are using Hangouts, see the fix above given by Reinaldo Araújo. I responded to it to clarify how to implement it. That worked for me. Before the fix, it worked in the Gmail web interface, but not from Hangouts on my phone. After the fix, it works with both. What could be the issue? Can anyone explain what are these arguments and what do they mean? The “Testing” lines are the bot checking what it just received against the various regular expressions (regex for short) that it was defined with. If it matches, it will run the code for that block. If it doesn’t match, it moves on to check the next regex. — git clone https://github.com/UlisesGascon/raspi_gtalk_robot.git and follow the same steps as in the blog entry. Ulises, I don’t suppose you’d be willing to help out a noob with a very similar project to this. I’ve been fighting through github the past few days and think I keep falling further down the hole lol. thank you very much for that tutorial. After I did the steps above, it works ! 🙂 … but could you please explain me, whats the “BOT_ADMIN, in the raspiBot.py file” for ? It looks like there must be a eMail adress…. ?!? another short question. The “BOT_ADMIN” account is actually not set. When I try to switch GPIO7 on or off, the raspberry answers, that it was done correctly, but it is not. Is the “bot_admin” the problem, because it is not set ? Thomas, your English is fine. I’m guessing you’re using a different numbering scheme than the code and therefore looking at the wrong pin. Take a look at the post above from “Alex” on January 20, 2013 for more info. thank you again for the answer ! I’m sure the problem here will be the same as described above. I will check that as soon as possible. This is exactly what I have been looking for. -but- I can not get it to login, with the correct user / pass. Did something change with gtalk & the xmpp protocol? No, mine logs in fine, but if you’re using hangouts, it won’t communicate correctly unless you follow the directions in the post from Reinaldo Araújo on May 12, 2014. He explains how to fix that issue, which gtalk did change. This code was correct in what was installed. There were no angled quotes. It was not copied from the web page. Unable to authorize on gmail.com – Plsese check your name/password. Hi, Is it possible to upload files from raspberry Pi via the google talk chat using this chatbot program or by tweaking the code?